Transco pipeline’s Compressor Station 206 is proposed near almost a thousand homes in the Franklin Township/South Brunswick area. Image courtesy of Central New Jersey Safe Energy Coalition. “If we don’t stop this project, the floodgates will be open to future projects,” says Barry Kutch, the leader of Central New Jersey Safe Energy Coalition, a new client of EELC. Mr. Kutch is talking about NESE, a proposed Transco pipeline project by S&P 500 company Williams that would transport fracked natural gas through New Jersey from the Marcellus Shale in Pennsylvania to energy markets in New York City. The project is designed to add 400,000 million cubic feet per day of additional natural gas transmission to New York City and is targeted to be in service for the winter heating season of 2019. The bigger picture he says is the profit to be made off fracking gas in the Marcellus Shale — a “gold mine” — that runs through Pennsylvania and up into New York State and down to West Virginia along the back of the Appalachians. He believes, unless the NESE project is stopped, it will be followed by more and more pipelines that transverse New Jersey and transport gas from the Marcellus Shale to energy markets around the world. The pipeline proliferation would lead to increasing reliance on and use of fossil fuels. The Safe Energy Coalition is one of several citizens groups that is opposing the project, both for its effect on communities — noise, pollution, and the danger of explosion and fires from the compressor stations along the route— and because the pipeline expansion does not make sense as energy policy. NESE would not provide any fuel or long-term economic benefit to New Jersey, as the natural gas would not be used or sold in New Jersey, and the fracked gas pipeline project would put in place long-term infrastructure to promote fossil fuel use rather than clean energy. Mr. Kutch’s group believes in clean energy plans, like the state of New York’s Clean Energy Standard, which ultimately emphasize moving away from fossil fuels. Clean energy plans fight climate change, reduce harmful air pollution, and “ensure a diverse and reliable low carbon energy supply.” This means reduced use of fossil fuels like natural gas and increased use of renewable energy sources such as solar and wind. Building even more capacity to transport fossil fuels just does not make sense when air and wind power, energy conservation and efficiency, and the electrification of transportation are all available and affordable. The technology is here. The $926 million NESE gas project, if built, will carry fracked gas from the Marcellus Shale in Pennsylvania along expanded capacity pipelines and then through almost twenty-seven miles of new pipeline from Sayreville, New Jersey across the Raritan Bay to gas terminals in Rockaway Queens. Williams Transco proposes a new compressor station at the Trap Rock Quarry near the towns of Franklin and South Brunswick, and Transco will increase capacity by increasing the velocity of gas running through aging Pennsylvania and New Jersey pipelines by building additional compressor units and power at existing facilities. Junior Romero of EELC client Food & Water Watch says that after New Jersey governor Chris Christie vetoed the “monumental” NJ legislation banning fracking and fracking waste, NJ Food and Water Watch focused on the fossil fuel infrastructure that carries the fracked gas. Mr. Romero says that New Jersey is a “spaghetti bowl of pipelines” and that citizens in Middlesex and Somerset counties have rallied to stop another one from being built. Food & Water Watch is supporting federal HR 3671, the “Off Fossil Fuels Act” legislation, as well as similar legislation in the state. 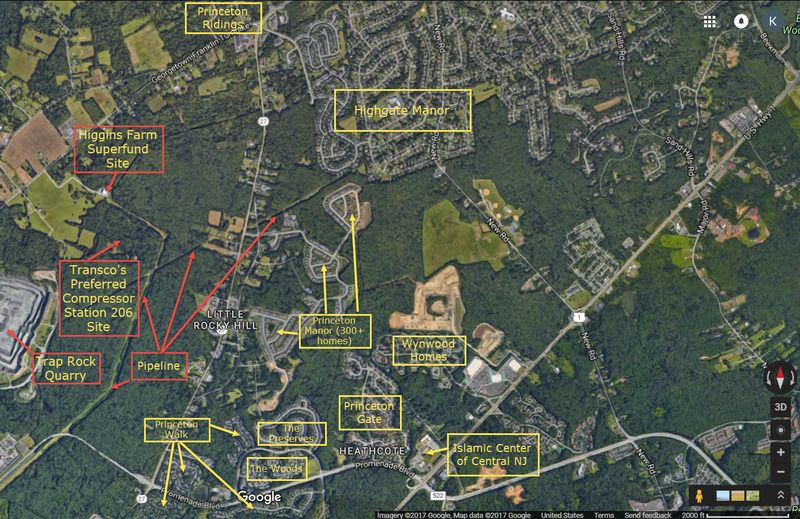 In the South Brunswick/Franklin Township area where Williams plans to build the new compressor station that would move gas through the pipeline, there are approximately 1000 homes including several nearby condominium developments, as well as a shopping center, preschools, and places of worship. Citizens fear the risk of leakage, fire, or explosion from increased capacity in aging pipelines, and they point to Williams’ record of accidents and safety violations and other accidents that have occurred across the country in compressor stations. 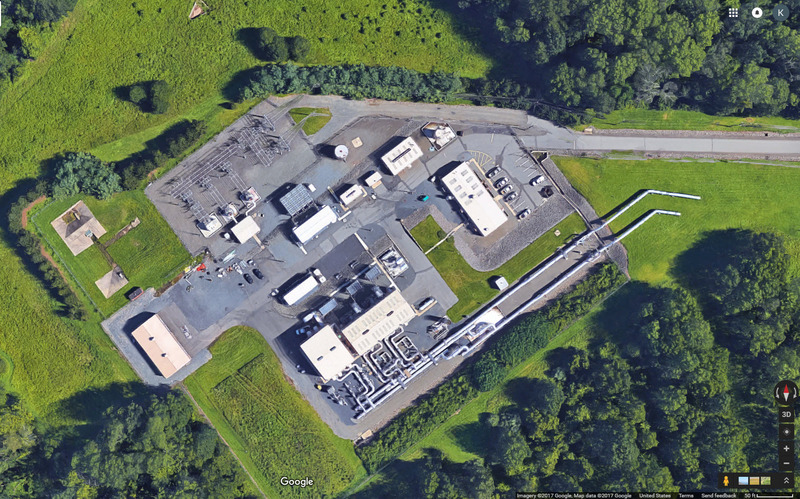 Compressor stations also emit pollutants. The proposed Compressor Station 206 is a factory-like facility. Two fifty-foot smokestacks vent exhaust gases from a six-acre facility that sits on a fifty-two acre site. Other citizens group have been formed to oppose the project including the Franklin Township Task Force on Compressor Station 206 & NESE . To get a sense of the size of pipeline compressor stations, this is existing Station 205 about nine miles south of proposed Station 206. This existing station is electric so does not have the smokestacks and emissions of the proposed station in the Franklin/South Brunswick area. Image courtesy of Central New Jersey Safe Energy Coalition. Along with Mr. Kutch’s group and the Princeton Manor Homeowners Association, which together represent thousands of residents who live near the proposed compressor station, EELC represents two environmental organizations which oppose the pipeline project, NY/NJ Baykeeper as well as Food & Water Watch. These environmental organizations say the pipeline will disrupt fishing, boating and recreational activities in the Raritan Bay, a sensitive and fragile ecosystem that has recently been experiencing significant regrowth. Construction of the pipeline will disturb 14,000 acres of habitat for clams, horseshoe crabs, fish, and other marine animals. Deborah Mans, Executive Director of the bistate NJ/NY Baykeeper says the trench installation of the pipeline through the Raritan Bay — the trench will be dug across the Bay with an underwater-like snowplough — will harm the successful restoration of the dynamic Raritan Bay ecosystem. Whales and dolphins are seen again; bait fish and the hard clam population have come back. The Bay now has an active clam industry and surf clam habitat has recovered. The proposed construction of the 23.49 mile Raritan Bay pipeline threatens to spread contaminated sediment that now sits on the bottom of the Bay throughout the water. What will happen to these newly resurgent populations during the estimated 12-month construction period? Ms. Mans says that Williams admits there will be short-term harmful impacts to life in the Bay, and her organization believes there will be long-term impacts as well. Williams’ prepared biological assessments have large gaps in data, Ms. Mans points out. “Williams has been really dismal with outreach about the pipeline along the Raritan shore,” Ms. Mans says, and there is a lack of awareness among residents about the impacts the NESE project will have. She commends the “amazing” community groups that have formed and the partnership among them to protect the Bay. Concerned and committed citizens who oppose the project in the South Brunswick and Franklin Township Area have gained support from their local municipal elected officials as well as from Senator Corey Booker and Congresswoman Bonnie Watson Coleman, who have both sent letters detailing negative impacts of the project to the Federal Regulatory Commission. Representative Coleman’s letter includes the signatures of all state legislators in the 16th and 17th Districts and many Mayors and Council members in the area. The townships of Franklin, South Brunswick, and Montgomery have all passed resolutions opposing the Compressor Station 206. FERC approves pipelines and is known as a rubber stamp for industry projects. Congresswoman Coleman has introduced federal legislation that would require FERC to examine if there is a public need for pipeline projects and to consider cumulative impacts of pipelines proposals. The Transco gas pipeline project which crosses three states presents risks to human health and the environment. The project includes new compressor stations near thousands of homes, a pipeline extension through sensitive marine environments, and the use of aging pipelines to transport natural gas from the Marcellus Shale region through Pennsylvania, New Jersey and the Raritan Bay to New York. Furthermore, NESE is a step backwards for state and federal energy policy and the environment by committing the region to unnecessary fossil fuel infrastructure that makes it more difficult for renewable energy sources to enter the market. Many state and federal legal and regulatory hurdles remain for the project. The Federal Energy Regulatory Commission, or FERC, is an independent agency that regulates the interstate transmission of electricity, natural gas, and oil. FERC also reviews proposals to build liquefied natural gas (LNG) terminals and interstate natural gas pipelines.